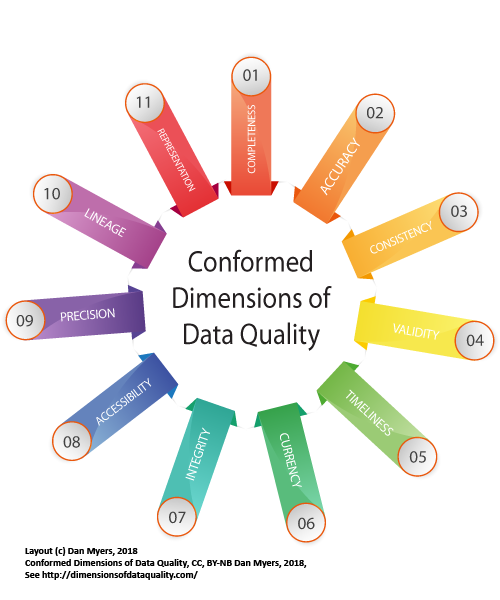 The following is the current version of the Conformed Dimensions of Data Quality (r4.3) and their underlying concepts. Each Dimension has one or more underlying concepts. The definitions of each of those are available here. Completeness measures the degree of population of data values in a data set. Accuracy measures the degree to which data factually represents its associated real-world object, event, concept or alternatively matches the agreed upon source(s). Consistency measures whether or not data is equivalent across systems or location of storage. 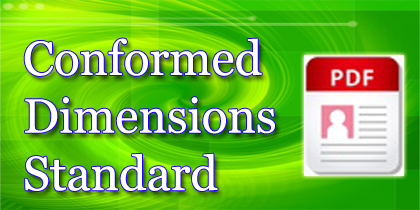 Validity measures whether a value conforms to a preset standard. Timeliness is a measure of time between when data is expected versus made available. Currency measures how quickly data reflects the real-world concept that it represents. Integrity measures the structural or relational quality of data sets. Accessibility measures how easy it is to acquire data when needed, how long it is retained, and how access is controlled. Precision is the measurement or classification detail used in specifying an attribute's domain. Lineage measures whether factual documentation exists about where data came from, how it was transformed, where it went and end-to-end graphical illustration. Representation measures ease of understanding data, consistency of presentation, appropriate media choice, and availability of documentation (metadata).